Recent decades have seen increasing concern as to the ability of jurors to understand and apply judicial directions in criminal trials. This has prompted reforms ranging from procedural changes to changes to the instructions themselves. While such modifications may improve juror comprehension and application, research indicates that the improvements are modest. The so-called “fact-based” approach to jury instructions incorporates many features that research suggests would improve juror comprehension and application. This article presents results from a large-scale study looking at whether fact-based directions can enhance comprehension and application of the law. The results provide some support for this approach as a means of improving comprehension and application. A particularly important finding was the extent to which group deliberation influences juror comprehension, and the use of fact-based directions may provide a framework to assist decision-making and encourage jurors to focus on the issues in dispute. Indistinct covert audio recordings frequently figure in criminal trials together with transcripts prepared by police officers who have been accorded the status of ad hoc experts on the basis of their prolonged and repeated exposure to the recordings. Drawing on research in linguistic and phonetic science, we explain why such transcripts are highly prone to be unreliable, why they may mislead juries into misinterpreting the contents of the conversations and why current court procedures for mitigating this risk are inadequate. We conclude by outlining a proposal drawn up and endorsed by senior expert linguists for establishing a process whereby reliable transcripts of indistinct covert recordings can be provided for juries. While free world society has a burgeoning reliance on technological access to legal platforms for both civil and criminal procedure, prisoners have little capacity to engage with computers and are typically banned from online legal sources. At the same time, the technologising of criminal procedure through the high uptake of audio visual links has seen the rapid decline of physical visits by lawyers to prisoners. Prisoners have limited reciprocal powers to demand technological access to the external world and must rely on largely obsolete forms of communication. In an era where legal resources are increasingly digital, can the continuing asymmetrical restrictions on prisoners’ access to technologies be justified? This article analyses recent Australian case law to understand the challenges presented for prisoners in the preparation of their legal proceedings. The effectiveness of the regulation of corporate illegality in Australia is increasing being called into question. In particular, it is often criticised that corporate regulators are timid in exercising their enforcement powers and fail to investigate offences and/or pursue significant penalties against “the Big End of Town”. This article seeks to understand the factors that influence enforcement decisions, focusing on the role of regulatory discretion. It will be argued that discretion plays a crucial role in implementing effective and responsive regulation, however such discretion must be guided by sound regulatory theory and exercised in both a transparent and consistent manner. 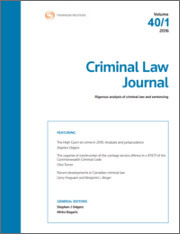 For the PDF version of the table of contents, click here: Crim LJ Vol 42 No 5 Contents.